Between February 2012 and October 2013, these two met in six major single matches. Five of those were for the IWGP Heavyweight Title (the main title in New Japan Pro Wrestling) with the sixth occurring during this year's G1 Climax tournament. All of those matches are considered to be excellent, with at least two of them securing ***** ratings, their feud as been compared to such legendary rivalries such as Flair vs. Steamboat or Misawa vs. Kobashi. Their first encounter occurred as I said in February 2012. Okada had only recently returned to NJPW at the previous months Tokyo Dome show, beating Yoshi-Hashi in about 5 minutes to a very underwhelming reaction. You may possibly remember Okada from his completely meaningless run as Samoa Joe's sidekick in TNA doing a gimmick inspired by Bruce Lee's character in the Green Hornet TV series. Nobody really gave him a chance to win here, as Tanahashi was NJPW's biggest star and was already enjoying a 13 month title run which included a record 11 title defences. However all good things must come to an end and shockingly Okada defeated him when he nailed him with the Rainmaker (short arm clothesline) after hitting with him Tombstone piledriver on the floor after Tanahashi had crashed and burned on a flip dive. People were stunned, and as Okada celebrated he found himself challenged by Tetsuya Naito. Okada made his first IWGP title defence on 04/03 against Naito in an absolutely fantastic match which went a long way to show that Okada could have great matches without having to be carried by Tanahashi. It really was a strong MOTY contender in 2012 and I rated it at ****3/4. This was where Hiroshi Tanahashi got his revenge and regained his title and has a result tied the all-time record for IWGP title reigns by winning his 6th championship. It was seen pretty much as a given that Okada would drop the title back to Tanahashi as the fans still saw him as not being on the same level as Tanahashi. However his short title run and especially the plaudits he got for his match with Naito meant that his first run as champion would be seen as very much a success. During the match they also started to build on their previous encounter, Tanahashi repeatedly managed to block Okada's Rainmaker finisher and also hit the Tombstone piledriver en-route to securing his spot in history with his High Flow (Frog Splash) finisher. Match was around the ****1/2 range. Kazuchika Okada then moved out of the IWGP title picture, as Tanahashi had ready made challengers in Togi Makabe and Masato Tanaka. However Okada was still very much in the plans and went on to win G1 Climax 2012 tournament which came along with the prize of challenging the champion at the Tokyo Dome show in January 2013. Okada pinned Karl Anderson to win the tournament and became the youngest winner of the G1 at the age of 24. However to get to the Tokyo Dome he would have to defend the title opportunity along the way, which he was able to do including a strong performance defeating Karl Anderson once again at the King of Pro Wrestling PPV. Also on that show Tanahashi defeated Minoru Suzuki in an absolute classic that was rated ***** by Dave Meltzer in the Wrestling Observer. From a drawing point of view this was a huge success for NJPW as they claimed that 29,000 paid to see the show in the Dome which would make it the most successful Tokyo Dome show for 10 years. It was also available on internet PPV and apparently secured 100,000 orders and the feed didn't break either. It was also a fantastic card, which saw 5 of the last 6 matches rated at **** or better. The best of the bunch was Tanahashi defending against Okada, with Okada winning the G1 tournament and having strong matches against a number of different opponents he was treated as a serious title challenger. Tanahashi was having legendary matches against all challengers and though the highlight up until now had been the Suzuki defence, he was on a string of ****+ title defences. This was another classic world title defence which built slowly, made perfect sense with wrestlers remembering to sell if they had a body part worked over for a period of time. They also produced an awesome ending with lots of big moves, great reversals and a finish which played off Tanahashi's attack on Okada's left knee before finishing him off with the High Flow. The match was rated ****3/4 in the Observer. To earn another crack at the IWGP title, Okada went on to win the New Japan Cup on 23/03 against Hiroki Goto in another very good match. Meanwhile Tanahashi was quietly cementing his status with another classic title defence against Karl Anderson from February. The scene was set and they would meet again at Invasion Attack. By now when Tanahashi faced off against Okada it now felt like a big major deal with the crowd reacting to everything that both guys did. This was also the first time that Tanahashi started to bend the rules which got him some boos from the fans. That's not to say that he was turning as that didn't and hasn't happened so far but a sign that the fans were equally invested in both wrestlers. With the fans reacting to both men when they made the ropes from a submission attempt or made a comeback from a period of selling. It looked like Tanahashi would successfully retain but he met only Okada's knees with the High Flow, after more great action Okada managed to follow a Tombstone piledriver with the Rainmaker to start his second run on top. This was rated ***** by the Observer and deserves it. The 2013 G1 Climax tournament was probably the most stacked in it's history with two blocks of 10 wrestlers and both Okada and Tanahashi were paired in Block A. They both also started pretty slowly so as they met on the eighth night of the tournament they both had 4-3 records. This would be the only 30 minute draw in the entire tournament, they still basically pulled out all their major moves including Tanahashi's big diving plancha, the High Flow, Okada's Red Ink (a move similar to the STF) and with time running out Tanahashi managed to duck under Okada's attempt to hit the Rainmaker. Match rated ****1/2 by the Observer. You wouldn't expect Okada as champion to win the G1 tournament and he didn't. He lost on the last night to Satoshi Kojima to fall out of the running and setting up another title defence. Tanahashi did win Block A by defeating Katsuyori Shibata on the last night, before losing to Tetsuya Naito in the finals in a matches rated at **** and ****1/2 respectively. The final encounter at least for a while, having 6 major matches in just over 18 months may seem like overkill but the story is going to put on temporary hold. Okada stated that if he couldn't beat Tanahashi then he would vacate the title, even a draw would not satisfy for him. Tanahashi on his part said that if he couldn't beat him then he would no longer be able to challenge for the title while Okada was still the champion. They even teased booking a champion vs. champion match (Tanahashi holds the CMLL Universal title in Mexico) but that was dropped. The thoughts going in was this was time for Tanahashi to get the gold back as it makes sense for NJPW to have their biggest star headlining the Tokyo Dome show in January. They went into this match with 2 wins each and the draw from the G1 so this was also for the bragging rights to see who would finally come out on top. They told an incredible story and built on everything they had done in their previous match and even adding new touches such as Tanahashi putting Okada in the Gedo clutch, this was great as Gedo is Okada's manager and he was flipping out at this apparent show of disrespect. Tanahashi worked consistently on Okada's right arm to the point where when Okada finally hit the Rainmaker it took him that long to make the cover, Tanahashi was able to beat the three count. His injured arm made his other finisher the Red Ink from being fully effective so again the challenger survived. They teased a count out spot when Okada hit by a flying plancha retaliated with a Tombstone piledriver that led to Tanahashi only just making the 20 count. However Tanahashi's luck would not last and after avoiding the Rainmaker several times he was eventually nailed by it for the loss. The Observer gave this match *****. For sheer match quality it is undeniable that the feud between Tanahashi and Okada should be considered one of the all-time great series, I have a soft spot for the Flair/Steamboat series in 1989 but from a in-ring perspective that doesn't match up to these two. I'm sure that they will have future great matches and the likely inclusion of Tetsuya Naito who is also a super talented wrestler means that NJPW is likely to continue to present awesome title matches and main events for a long time to come. TNA only now offer 4 PPV events are year, with that in mind you would think that TNA would consider these shows to be very important with strong storylines leading to their fans wanting to pay good money to see the conclusion play out on PPV. Bound for Glory is TNA's biggest event of the year, and other the last few years have seen the company running a BFG Series to determine the challenger for their world title. This year was no different and with very little surprise AJ Styles was the victor and will go on to challenge Bully Ray for the gold. Since winning the BFG Series, AJ Styles has had very little interaction with Bully Ray on TV and if you weren't paying that much attention to the product then you'd be hard pressed to realise that he will be facing Bully Ray for the title in a storyline that has taken 12 months to get to. What you will have seen is Impact's final segment over the last few weeks ending with interviews from Dixie Carter, AJ Styles and Hulk Hogan with each one frankly being more ridiculous than the last one. Let's have a look at each of the closing segments of the last few weeks and highlight where TNA is doing a fabulous job of shooting themselves in the foot. This was confrontation between Carter and Styles. Styles stated that he was working without a contract (he isn't as he's got a short term contract until the end of the year), that Dixie had destroyed the chemistry of what made TNA great. That she didn't understand how to treat the stars and mentioned Jerry Lynn, Petey Williams, Jay Lethal, Alex Shelley and Low-Ki left because of it. That she wasted money on wrestlers who treated TNA like being on a paid vacation (probably RVD & Booker T). None of the guys he mentioned would make a difference to TNA and Jerry Lynn has retired. Dixie responded by saying that she was sorry she had ever given him the impression that he was important to TNA, she said he was average and not as good as he used to be. If it wasn't for her and her family than he would be living in a trailer park. That AJ Styles did not build this house and that he should be thankful that she ever allowed him to play in it. Dixie really did come across as a very poor imitation of Stephanie McMahon. So after watching this, you have to wonder why AJ Styles is trying to win the TNA World title when he feels the company has been destroyed and he doesn't have a contract to stop him leaving. Meanwhile Dixie is pointing out that the challenger in the main event of the biggest TNA show of the year, isn't very good and he was never 'phenomenal' and although he was never great to start with he's worse today then he was years ago. This saw firstly a Hogan promo where he was trying to get fans to show AJ that they wanted him to stay with the company. It wasn't the greatest reaction immediately but Hogan stuck with it by practically begging the fans to cheer for Styles. Styles did come out to a nice pop, Hulk said he'd fix things later on. Later turned out to be our main event segment, things started well when Hogan gave Styles a new contract to sign and said he believed in him. Enter Dixie Carter, who immediately gushed out brilliant Hulk was and how much of a difference he had made to TNA. I know Hulk has complete control of his angles but it's quite a stretch to take that comment seriously. Dixie then ripped up the contract, Styles said that was the biggest mistake that she had ever made. She responded by telling him to get out of the ring, and just like a child being told off by their parents off he went never to be seen again. She then complained how hard her life was and how nobody understood just how difficult it was making all those hard decisions and the fans should respect her. She now knew what she had to do to help TNA and she wanted Hulk to join Team Dixie. This week really gave no reason for anyone to rally behind AJ Styles, he was basically treated as someone who should be quiet when the 'important' people are talking. Dixie's promo clearly shows that she thinks Styles is not any kind of asset to the company, while Hogan in his 60's and someone who will never wrestle again is essential to the success of TNA. Another bad week for AJ, though he did manage to cut a promo stating he would take the title from Bully Ray. Dixie then went to have security throw him out but Styles chose to leave voluntarily because he didn't want to breathe the same air as she did. This AJ is really someone who'll stick up for himself. 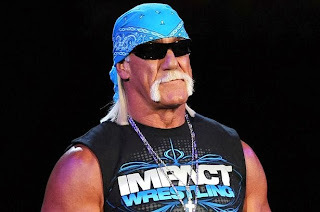 This left Dixie to concentrate on the really important issue of Hulk Hogan, Hogan by all accounts has left TNA although this could easily be a swerve and he ends up playing a key role at the PPV. Dixie wanted to know if Hogan was going to join Team Dixie, Hulk said he'd always wanted to be a part of a power couple and teased he would agree. Finally though he told her he was quitting, Dixie thoroughly dejected immediately fell to her knees and grabbed his legs and begged him not to leave. You have to hand it to Hulk, he really does understand that if you can choose to put yourself over then why even consider trying to help any other wrestlers or the company. As the show ended it was clear that the only person who could be considered a winner was Hulk who left with his integrity intact, Dixie and TNA looked like bunch of sorry losers. TNA will probably wonder why the Bound for Glory show will not do well, but they should understand that having Dixie come across as a low rent Stephanie, Hogan be the only star on the show and they are telling you he's gone that your not going to do well. Finally having AJ as a weak lead babyface who hates the owner but doesn't have the guts to find something better is a recipe for disaster.